Originally posted: August 27, 2018 . Last modified: December 11, 2018 . 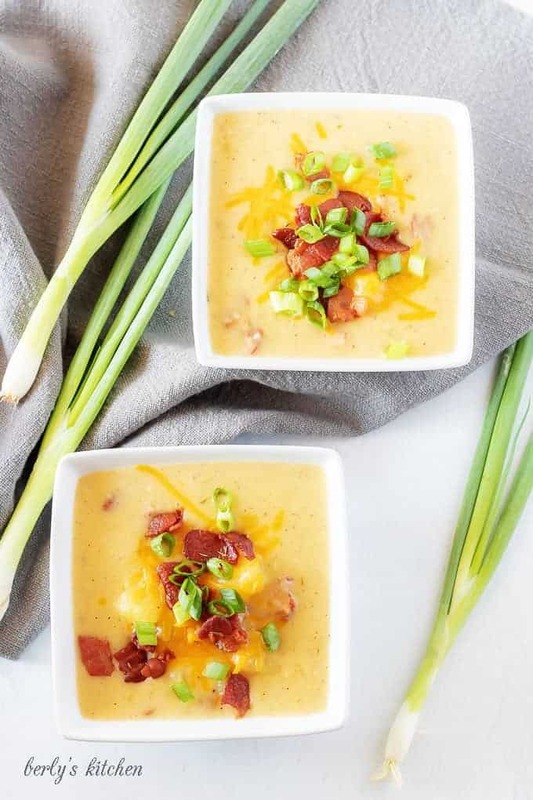 An instant pot potato soup with bacon recipe that’s loaded with all your favorite ingredients, like cheddar cheese, garlic, onions, potatoes and thyme. 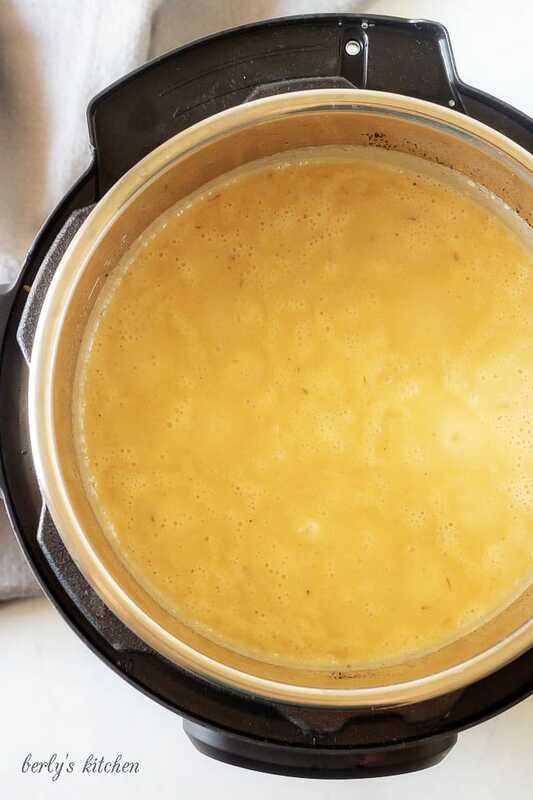 So, if you don’t have an Instant Pot, that’s okay, just click that link for a stove-top version of this potato soup with bacon. Honestly, I’m not sure which soup recipe I like the most. Both options have all my favorite ingredients, like bacon, cheese, and a heavy cream base. 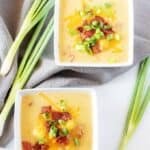 The main difference between each potato soup with bacon is the Instant Pot version takes a little less time. If you happen to be pressed for time, then I recommend you give this dish a try. While this might seem abrupt, how about we stop chatting and start cooking? First, start by turning on the Instant Pot and setting it to saute. Now, add the uncooked bacon to the pot. Cook it until it reaches the desired crispness, then remove the bacon from the pot. Turn off the instant pot and drain out any excess grease. Next, turn the Instant Pot back on and set it to saute once again. Then add the butter, onion, and garlic. Saute everything for 2-3 minutes or until the onions are soft. Be sure not to over cook the garlic or it with become bitter. 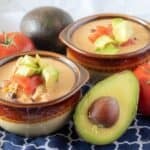 Turn the instant pot off the saute function. At this point, it’s time to return the cooked bacon back to the pot and add the broth, potatoes, thyme, salt, and pepper. Stir all of the ingredients to combine them. Then, close the lid and make sure the valve is turned to “sealing.” Set the Instant Pot to manual pressure/pressure cook high for 10 minutes. While the soup cooks, whisk together the heavy cream and flour and set the mixture aside for later. After the 10-minutes are up, complete a quick release. Remove the lid and set the Instant Pot back to saute. Afterwards, carefully add the heavy cream mixture and shredded cheddar cheese while stirring the soup. Continuously stir the soup until it thickens. It should only take about 3-4 minutes. Last, pour 1-cup servings of the soup into bowls and top with additional bacon, cheese, and green onions if desired. 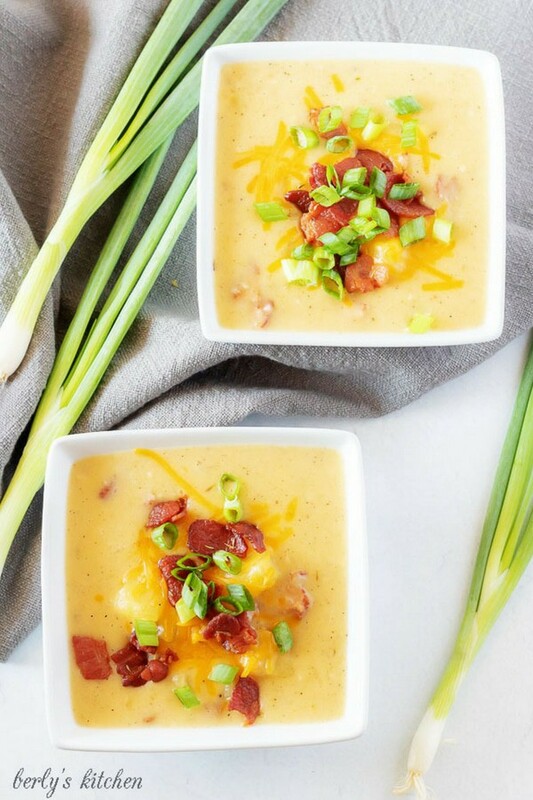 Serve the potato soup with bacon immediately and store any leftovers in the refrigerator for up to 3 days. Make sure you cut the potatoes into 1-inch, bite-sized, chunks; otherwise, the potatoes will not cook properly. In regards to the potatoes, you can choose any variety of potato you desire. We chose golden or yellow potatoes simply because that’s what we had on-hand. To create a vegetarian potato soup version, leave out the bacon. Have a hankering for potatoes? 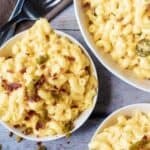 Then check out these other great potato recipes: Instant Pot Funeral Potatoes or our Cheddar Cheese Scalloped Potatoes! 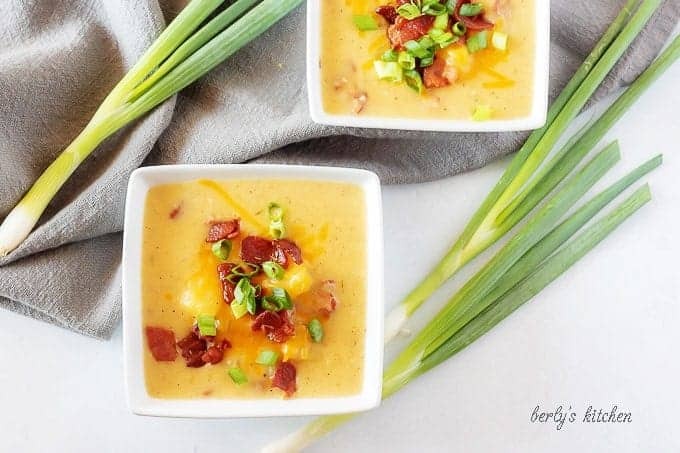 An instant pot potato soup with bacon recipe that's loaded with all your favorite ingredients, like cheddar cheese, garlic, onions, potatoes and thyme. First, turn the Instant Pot to saute and add the uncooked bacon to the pot. Cook until it reaches the desired crispness, then remove from the pot. Turn off the pot and drain any excess grease. Next, turn the Instant Pot back to saute, then add the butter, onion, and garlic. Saute for 2-3 minutes until the onion is soft. Turn off the saute function. Then, add the cooked bacon, broth, potatoes, thyme, salt,and pepper. Stir the ingredients to combine. Afterwards, close the lid and make sure the valve is turned to “sealing.” Set the Instant Pot to manual pressure/pressure cook high for 10 minutes. While the soup cooks, whisk together the heavy cream and flour. Set aside. Last, after the 10 minutes, complete a quick release. Remove the lid, and set the Instant Pot back to saute. Carefully add the heavy cream mixture and shredded cheese while stirring. Continue to stir until the soup thickens (about 3-4 minutes). Top with additional bacon, cheese, and green onions. Serve immediately. The calories listed are an approximation based on the ingredients and a 1-cup serving size. Additionally, the calorie count does not include any garnishments, like extra bacon or cheddar cheese. 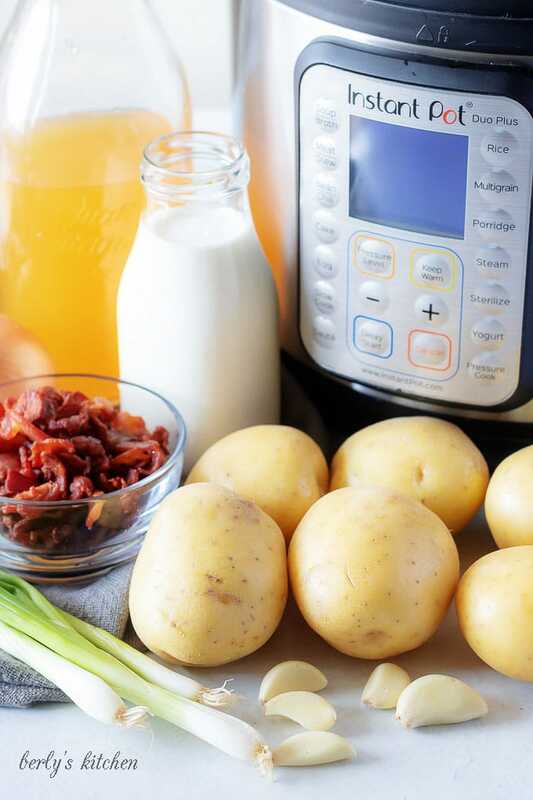 The potato soup with bacon can be stored in your fridge for up to 3-days in a sealed container. Will this work without the heavy cream if I don’t have that ingredient?